What is energizing for you and the Morningside congregation about this chapter of ministry? The Morningside Presbyterian Church Session and congregation have been on quite a journey since Pastor Paul Reeves joined us as Interim Pastor in late 2016. Our journey began in early 2017. Worship attendance had fallen from 45 three years before to 31 in 2017. The membership roll fell from 95 to 52, after we assessed membership more realistically. Leadership was stretched thin, each Elder handling multiple responsibilities. Leadership was older and more tired each year. Property management was burdensome. It felt like a mandate rather than a mission—to obtain rent from two nesting churches and to keep revenue flowing from our Children’s Center. We anticipated 2-3 years of financial solvency before our reserves would dwindle to nothing. Most important of all, we had lost sight of our purpose. What did God want us to do in this place at this time? All these realities were validated by the Holy Cow assessment tool—which we used to measure our energy, satisfaction, and ability to change. We were really low on all those dimensions. Things have changed at Morningside since we revisited the New Beginnings process and decided on a Parallel Start for our future. Making any decision about a way forward brings a sense of relief from the dilemma of having multiple paths to choose from—and we experienced that. Making a decision by asking for help, admitting that we can’t succeed alone, being honest about our strengths and weaknesses, giving up some control, and actively opening up to the Holy Spirit, brings more than a sense of relief—it brings a new sense of assurance that God will be with us as we seek some continuity for the legacy church and change through the new congregation. We are a faith community that has found that small numbers are not an impediment to worship. Rather, we are a close-knit community that counts our many blessings, gathers in praise of the God who has been and continues to be our guide. Our leadership is no longer alone—we have support from two sources: first, the congregation. 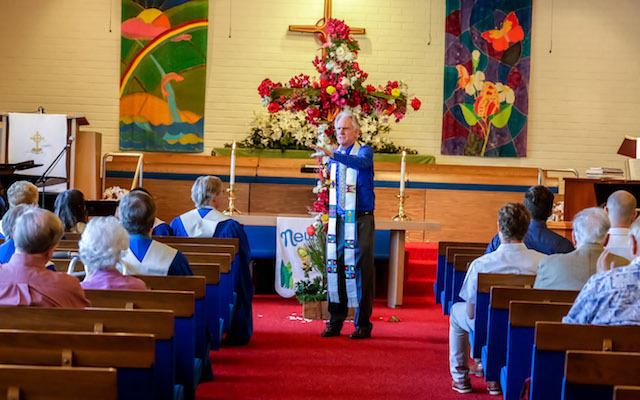 I look around at those who come to worship every Sunday morning, and everyone has a “leadership” role in our community; second, we have new partners in the Presbytery. Property management is no less burdensome, but it is more missional. If our campus is to be the home of a new congregation, then we have some house cleaning to do. We have almost completed a legally compliant employee manual, and we are fully evaluating the Children’s Center. At our stewardship campaign last fall, pledging increased after the decision to support a Parallel Start! This was a solid “vote of confidence,” it demonstrated that stewardship extends beyond our current congregation, and it is a sign of hope. How Did This Change Happen, Both in Faith and in Attitude? Pastor Paul led the Session through a study of “The Blessed Church” by N. Graham Standish. We learned to listen rather than talk, to “be” rather than to continue “doing”, and to be alive to God’s presence. The Session didn’t have “the answer” or the “solution” before anyone else in the congregation. All we could do was to set up the time and place to be together, and to know that God would be with us. A series of four congregational workshops followed. Only one thing was certain– retaining the Children’s Center was required in any future scenario. To look at us now, nothing would seem to have changed (the same numbers in worship, the same uses of the facilities)—but God blessed us with a dose of reality and insight into new ways to use our facilities, and now we are energized by the prospect of change. What about this step into a “parallel start” is requiring a new understanding of listening to and trusting Jesus Christ? Being honest about our strengths and weaknesses. Forgive us if we ask occasionally, “But what about us?” With the focus on finding a pastor for the Parallel Start, it is easy to feel neglected. In response, Session has decided to start a new discussion series to think about our own vision and mission since we remain an active faith community, regardless of the nature of the new congregation. Setting up the time and place to “be” church and to continue to seek God’s will for Morningside is critical while the Pioneer Pastor Nominating Committee seeks the new pastor. With the focus on the Parallel Start, we have two jobs—to nurture the remaining Morningside community, and to make preparations for the new pastor. We have to plan to shrink our budget to about 25% of our resources, and to allocate about 75% of our resources to the Parallel Start. So there is some discomfort along with the excitement, for that too, God will provide—we only have to ask.